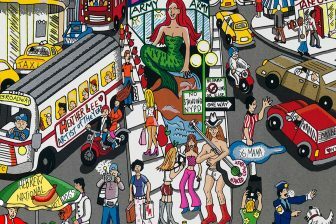 Museum Editions, Ltd. announces the addition of an exciting, new, interactive, virtual 3D art gallery to Charles Fazzino’s 3D pop art website. Developed by New Zealand firm EXHIBBIT, the gallery revolutionizes the way three-dimensional artwork is displayed on the internet by utilizing an intuitive interface that creates an exhibition experience much closer to reality than anything else online. The 3D gallery showcases Charles’ work in high resolution with a navigation system that allows the viewer to zoom up really close to see the incredible detail in Charles’ multi-layered artworks. “I am so excited about my new virtual 3D gallery! It’s so hard to show people what 3D art really is unless they see it in person. Now my fans and collectors can click on a piece of art, zoom in, zoom out, tilt and turn, and get a close-up view of my work as if they’re in a gallery instead of at their computer. 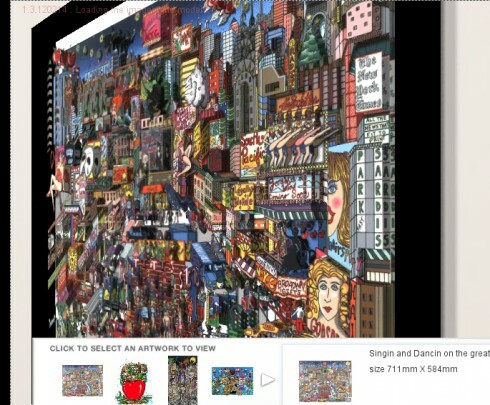 It’s an amazing feat of technology, “said Charles Fazzino from his New Rochelle Studio. 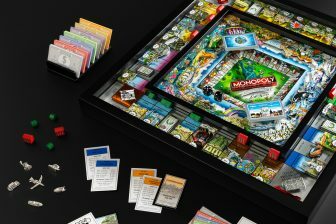 See the new Virtual 3D Gallery and the entire Fazzino collection at www.Fazzino.com. 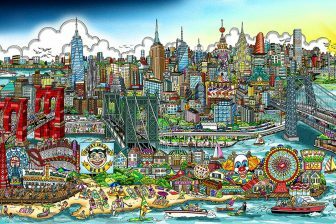 Charles Fazzino — one of the most popular artists in the world — is most well-known for his unique, detailed, and vibrant three-dimensional style. His work is exhibited in hundreds of fine art galleries and museums in twenty different countries. He is an officially licensed artist of the National Football League and the Super Bowl (2000-present), Major League Baseball and the MLB All-Star Game (2003-present), and the US Olympic Team (2000-present). He has also recently created official artwork for high profile events, including: the 2011 Centennial Celebration for the City of Fort Lauderdale, the President’s Challenge for President’s Council on Physical Fitness and Sports, The Andy Roddick Charity Gala, CMA Awards, Grammy Awards, Daytime Emmy Awards, NBC’s “Today” Summer Concert Series, the President William J. Clinton Presidential Foundation, among many others. Exhibbit can create an exact 3D replica of any gallery for curatorial purposes, online exhibitions and to allow the contents of stock rooms to be shared with the public. Exhibitions appear on your website, and can contain your own gallery branding. 3D gaming technology is used as a basis for this platform, but the experience is not at all like a video game. The presentation is elegant and the environments have the ambience of a real art gallery. There are three different galleries on the website to choose from and includes software for you to create and self-manage your own exhibitions. They are shared via the web, email or social media.